Can Tho (VNA) – Deputy Prime Minister Vuong Dinh Hue has called on the German Government and the German Agency for International Cooperation (GIZ) to continue helping Vietnam with the planning work and building policies and institutions for regional connectivity and response to climate change in the Mekong Delta. Hue expressed made the call at a reception in Can Tho on September 26 for Luisa Bergfeld, Development Counsellor and First Secretary of the German Embassy in Vietnam, and GIZ Director Jasper Abramowski, which was held on the sidelines of the Conference on Sustainable and Climate-Resilient Development of the Mekong Delta. He expected that the German Government and the GIZ will continue assisting Vietnam in planning and analysing potentials and strengths of each province and establishing a development sharing database in the Mekong Delta region. Having noted that climate change has caused direct impacts on the lives and production of local residents in the Mekong Delta, the Deputy PM suggested the GIZ to offer assistance in human resources to manage local natural resources, and support localities in the region to restructure agriculture and cultivate crops that are resistant to saltwater intrusion. Regarding renewable energy, Hue said the Mekong Delta region has a lot of potentials in this field and hoped Germany to analyse and evaluate the region’s potentials in wind, solar, and biomass energy and support the implementation of some pilot projects on renewable energy. Luisa affirmed that the German Government will work closely with its Vietnamese counterpart in the fields of finance and technique. 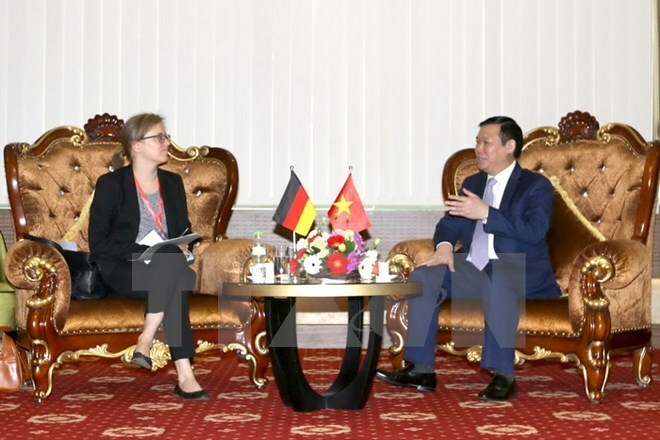 The negotiations between the two governments in 2017 and 2018 aim to build cooperation plans in the following years, she said, adding that Germany is particularly interested in coastal environmental protection in Vietnam.